Some of Wall Street's largest banks stand to win big from the tax bill now hurtling its way towards the president's desk — but among them, Wells Fargo will make out the best. That's according to an analysis released Monday by the equity research team at Goldman Sachs, which ran the numbers from the compromise measure that was revealed by Congress on Friday. The bill, which could be enacted within days, will give the country's seven largest banks — not including Goldman itself — an average 14% increase in earnings, Goldman found. That's because of the plan's big cut in the corporate tax rate -- from 35% to 21%. Wells Fargo (WFCPRJ) would make out the best, with an 18% boost, in large part because it derives nearly all of its profits from the United States, Goldman said. The company declined to comment for this story. Citigroup (C), by contrast, derives only half of its revenues from the U.S., and so would see its earnings per share increase by only 10%. Wells Fargo could use some good news. Its earnings per share tanked last quarter amid investigations into its pre-crisis mortgage bonds. The company's reputation has suffered mightily in the wake of scandals involving the creation of thousands of fake bank and credit card accounts and bills for auto insurance that customers didn't need, which led to the resignation of its former CEO, John Stumpf. What will financial institutions do with all that new found cash? Many banks have signaled their intention to return more money to shareholders. At an investor presentation earlier this month, when asked about how regulatory rollbacks might impact those plans, Wells Fargo CEO Tim Sloan said higher returns for investors were in the cards. "Is it our goal to increase return to our shareholders and do we have an excess amount of capital? The answer to both is, yes," Sloan said. "So our expectation should be that we will continue to increase our dividend and our share buybacks next year and the year after that and the year after that." The bank has cut employees this year at its Charlotte, North Carolina, headquarters and at a Pennsylvania call center. Banks won't necessarily be the biggest winners from the corporate rate cut. Telecom companies, which pay the highest effective tax rates on average, will see an enormous boost in after-tax profits, according to Howard Silverblatt, senior index analyst at S&P Dow Jones Indices. 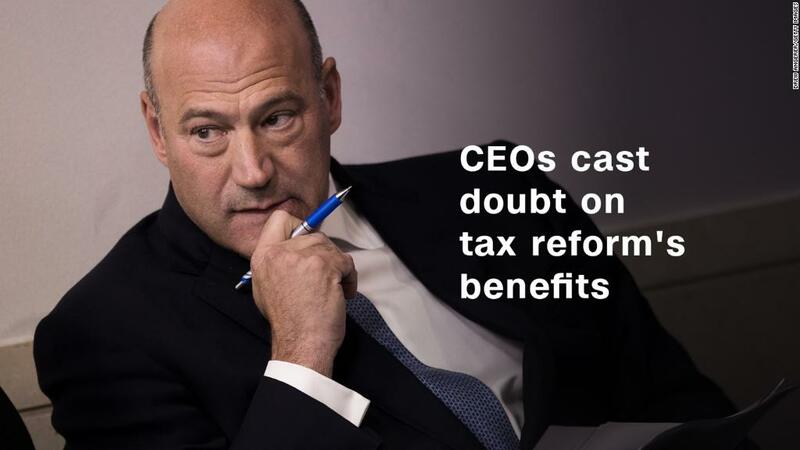 Companies that have already reduced their effective tax rates into the single digits, like General Electric (GE), will see little to no benefit. But there's more good news in the tax bill for banks: They may benefit even further from new deposits of cash brought back from overseas, as well as from higher interest rates as the Federal Reserve works to cool off any excess heat in the economy caused by tax cuts.